Hearing loss is a fairly common part of aging. It can also be caused by loud noises, medications, infections, head or ear injuries, congenital or hereditary factors, a variety of diseases, and many other things. As of 2001, hearing loss affected approximately 28 million people in the United States. 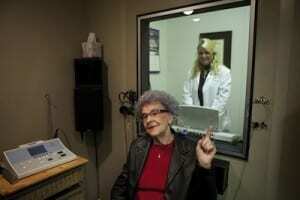 Hearing loss is the number one birth “defect” in America. It is particularly common in older adults. You have trouble understanding all the words people say. You don’t always hear the entirety of a joke and wonder what people are laughing at. You believe that people mumble too much. You miss details of meetings and need to be brought up to speed. People tell you that you play the TV and radio too loudly. When the doorbell or telephone rings, you often miss it. You’ve developed the habit of looking at people when they’re talking so you can hear and understand better. If you said, “Yes, that’s me” to any of the above, you should schedule an appointment with an audiologist for an audiometric evaluation. This is a diagnostic hearing test that allows the audiologist to determine the type and degree of your hearing loss and reveals how well or poorly you understand speech. During an audiometric evaluation, the audiologist will take your complete case history and visually inspect your ear canals and eardrum. The test helps to determine if your hearing problem could or should be treated with surgery, hearing aids, medications or a combination of the three.